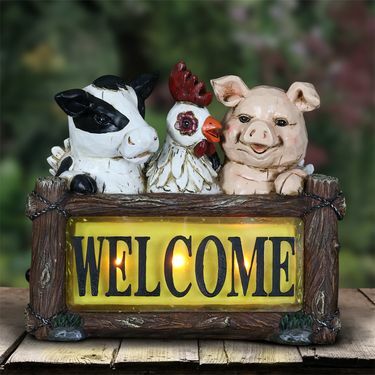 Adorable hand painted farm animals pop up to say welcome in this beautiful solar garden statuary. The solar powered LED light automatically glows at dusk so you can enjoy this sign day and night. Makes a whimsical and charming addition to your garden. Size: 11.5" x 6.75" x 9.75"H., approx. 5 lbs.